…. to benefit from the increasing use of mobile for information, transactions, etc. Think of it as living together before getting married. A couple of financial institutions have recently created Apps to anyone as a way of engaging with people through their phones. The institutions are hoping that the Apps will build trust with their users – and those users will eventually become customers. Assuming they have credit scores, any consumer can get their three-digit numbers using the CreditWise App from Capital One, for instance. More recently, Ally Bank has been testing Splurge, a financial health app that anyone could sign up to try. Apps are entering the market to expand opportunities with current Customers as well as to attract new Customers with new Mobile Services that deliver a great consumer experience. Banks are taking notice by exploring new services and testing how to develop relationships through financial guidance with Apps – rather than focusing on products or for a person to show up at the branch counter. This is important to extending reach into the market with a greater presence in mobile to increase branding, particularly millennials, who tend to gravitate to Apps. 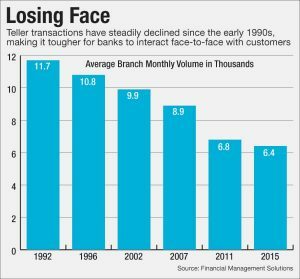 The move also speaks to the evolution of mobile — as banks, mostly the larger banks, have built out their Standard Mobile Apps. Extending on this, many banks are exploring other use cases and various deployment scenarios that make it easy for people to connect with them. This is viewed as an inflection point that reflects changing behaviors and Customer expectations. Further Apps have high value that provide capabilities outside of the core banking functionalities to assist how to create sales opportunities at a time when branch transactions are declining. Further, consumers have many choices to address their financial needs and are increasingly using nonbank Apps (ie: Mint, Qapital, Penny, etc.) to get advice and perform transactions. To compete for eyeballs—and to open up the opportunity to sell them something later on—banks need to create general as well as many category Apps to expand relevance and revenue opportunities in mobile. The general Apps are also similar to functions like those that help customers shop to go beyond transactions. Similarly, some banks make portions of their App features available to noncustomers. For example, USAA – a digital innovator, lets consumers view areas of loan calculators, news center, virtual assistant and help to varying degrees before needing to login, for instance. Wells Fargo and JPMorgan Chase are among the banks that have recently updated their unauthenticated mobile banking Apps’ designs. Since banks spend so much money on mass marketing, a Mobile App has potential to drive more engagement. “Maybe if you can create a more frequent, deeper engagement with noncustomer then it might be a more cost effective way of marketing,” said Oliwia Berdak, senior analyst at Forrester. However, before exploring general Apps, banks would have to figure out how to be better at business innovation to find the Apps that matter, failing fast on those not getting traction, enable business people to drive mobile initiatives, get a fast ROI, etc. In conjunction with this, it’s important to have strong marketing programs to increase awareness and have a compelling reason to download the App – for more opportunities and improve business outcomes – which happens if the App is useful, so it will be used.